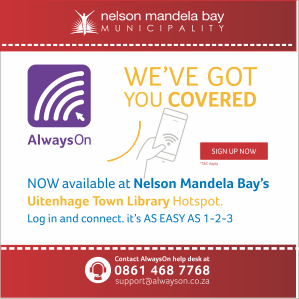 Welcome to the Nelson Mandela Bay Municipality WiFi services. 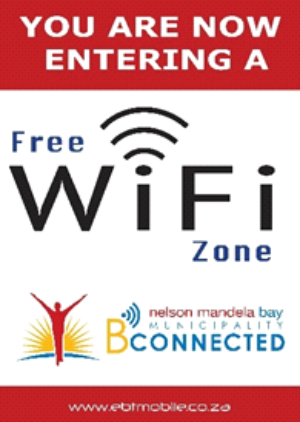 Nelson Mandela Bay Municipality noticed the need for free internet connectivity and embarked on two major WiFi connectivity projects. It is important to note that both cater for the broader public but, at the same time, also for a specific target group. Below, a break-down of the two WiFi services. e-connect service is a dedicated in-door service that brings the classroom to you. On registration, it allows students to link up with the NMMU learning sites and the NMBM website for free. Each person gets 100Mb per device per day for free to brows other sites not listed above. Q. What is B-Connected? 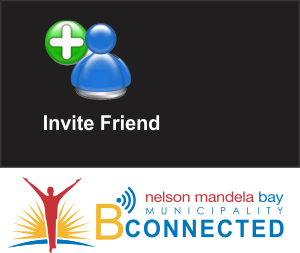 B-Connected is the Nelson Mandela Bay Municipality’s new broadband project that delivers affordable wireless voice and internet services to residents and businesses of the Metro. Q. Which Municipal venues offer Free Wi-Fi? Q. Where will these services be available? Q. What do I need to connect? A Smart Phone, to activate your Wi-Fi on your phone Q. What do I need to connect? Q. Is it for free? "Free basic” – If you qualify for free Basic Water and Electricity Services from the Municipality, you will also receive Free Basic Internet. Up to date Municipal Account – If your Municipal Account is up to date, you receive a limited free data bundle. Up to date Account Arrangement – If you keep up to date in paying your municipal account as arranged with the accounts department, you receive a limited free data bundle. Q. How do I benefit? Wireless Internet: You get limited free access to the internet if you qualify for it. Internet Data is made affordable; you can buy Internet Data using your smartphone for R50 per GIG. When you register as a user you get 30 days "on-net” calls for Free. Q. Can I use it even if I'm not a student? Yes. Q. Can I use it even if I'm not a student? Q. Why is it only available inside the venue - I want to sit outside? Q. How many free data do I get and for how long is it active? 100 Meg p/day p/device Q. How many free data do I get and for how long is it active? "Free basic” – 250meg per month.-Up to date Municipal Account – 1 Gig per month. Free data bundles will expire at the end of each month. Data bundles bought does not expire. Q. Are there any free websites and what are the URL's? Yes, NMBM web site and the three learning sites for the NMMU students. Q. Are there any free websites and what are the URL's? Free educational content will be available soon. Q. Do I have to register and why? Yes, for security reasons. Q. Do I have to register and why? Yes, for security reasons and to benefit from the Free Data packages available.For Wireless Voice RICA also require users to register. Q. How do I connect? Connect on your Wi-Fi and link onto your browser. Q. How do I connect? Wireless Data – Connect on your Wi-Fi and link onto the browser. Q. Can I carry my data over to the next day? No, you get another 100Mb the next day. Q. Can I carry my data over to the next day? Yes, free data only expires at the end of each month. Data purchased does not expire and carry over into future months. Q. Will I lose my data if I go to another venue? Not if you have not used up your 100mb of data. You can take it from one venue to the other. Q. Will I lose my data if I go to another venue? No, the NMB BConnected Network has multiple connection points. Q. Who pays for it? The National department of Telecommunication has paid for this service for 24 months. Q. Who pays for it? Free Data is paid for by the Municipality. Affordable data and voice packages are paid outside the free bundles are paid for by the user. Q. How do I get help if I’m stuck? 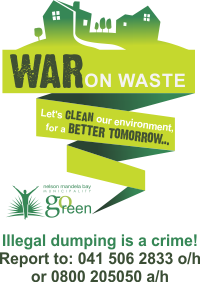 You can call the Call Centre Number 0861 468 7768 or visit support@alwayson.co.za Q. How do I get help if I’m stuck? Q. Can I transfer my data to another person? No. Q. Can I transfer my data to another person? Q. How many devices can I connect in one day? As many as you want. Q. How many devices can I connect in one day?